On May 15, 2018, Google will be sunsetting Flash in the IMA SDKs. This change will affect all users of the Flash IMA SDK, and a very small number of users of the HTML5 IMA SDK. We strongly encourage all publishers still using the Flash SDK to migrate to the HTML5 SDK. As part of this sunset, we will also be removing the Flash SDK documentation from developers.google.com and removing the Flash samples from GitHub. As of May 15, 2018, the HTML5 IMA SDK will stop supporting all Flash ads. This includes linear, non-linear, and companion ads. If your VAST response includes only Flash media files, the IMA SDK will throw error 403 - VAST_LINEAR_ASSET_MISMATCH for linear ads, and error 503 - VAST_NONLINEAR_ASSET_MISMATCH for non-linear ads. Flash companion ads will fail silently. The HTML5 SDK stopped supporting Flash VPAID ads with the deprecation of the Flash IMA SDK last June. This entry was posted in Ads Developer Blog and tagged ima_flash, ima_html5, ima_sdk, sunset on April 24, 2018 by Google Ads Developer Advisor. As previously announced, as of March 15th, 2018, the Google Media Framework (GMF) for Android is deprecated in favor of the IMA ExoPlayer plugin. All development and support for GMF has been halted. If you are a GMF Android user, we recommend you migrate to the IMA ExoPlayer plugin at your earliest convenience. Alternatively, to keep using GMF Android, you will have to fork and maintain it yourself. Note: We are NOT deprecating GMF for iOS. If you have any questions, feel free to contact us via the IMA SDK developer forum. 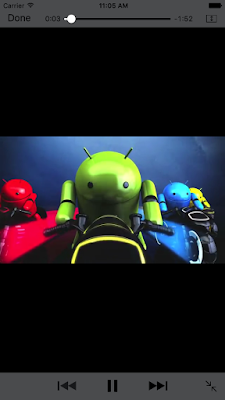 This entry was posted in Ads Developer Blog and tagged Android, deprecation, GMF, ima_android, ima_sdk on March 26, 2018 by Google Ads Developer Advisor. We’re excited to announce that we’ve teamed up with the Accelerated Mobile Pages team to bring you amp-ima-video, an IMA-SDK-enabled video player extension for AMP pages. This extension has been an AMP experiment for the past few months, but today we’re moving from experiment to public release. amp-ima-video provides an AMP-enabled video player with the IMA SDK pre-integrated, so you can easily play and monetize content on your AMP pages. Simply provide your content URL and an ad tag, and we’ll handle playing back the video and ad(s). The extension currently supports linear in-stream single ads and VMAP playlists. To see it in action, check out the AMP by Example page for the extension. If you have any questions or issues with the extension, please file them via the AMP issue tracker on GitHub. This entry was posted in Ads Developer Blog and tagged AMP, ima_html5, ima_sdk on February 13, 2018 by Google Ads Developer Advisor. With the release of v3.7.0 of the IMA iOS SDK, we will stop providing forum support and bug fixes for iOS IMA SDK issues specifically related to iOS 8 and below. What does this mean if an app is currently targeting iOS 8? There are no changes in v3.7.0 specifically designed to break compatibility, so the iOS IMA SDK will continue to work with iOS 8 in the short term. However, future releases are not guaranteed to continue to work with iOS 8. Bugs that only affect iOS 8 will no longer be investigated. If you are using our GoogleAds-IMA-iOS-SDK CocoaPod and want to update to v3.7.0, you'll need to start targeting iOS 9+. What about other iOS versions? We periodically stop supporting older iOS versions when adoption levels fall below a certain level. Whenever we end support for a major iOS release, we make announcements on our blog and release notes page. As always, if you have any questions, feel free to reach out to us on our support forum. This entry was posted in Ads Developer Blog and tagged deprecation, ima_ios, ima_sdk on February 12, 2018 by Google Ads Developer Advisor. MacOS High Sierraincludes a new version of Safari, Safari 11. This new version by default will remove support for auto-playing videos unless they are muted. If your desktop site currently autoplays unmuted video with the IMA SDK, your users will see the first frame of the ad, but the ad will not play. To resolve this, you can either change your implementation to click-to-play, or attempt to autoplay and revert to click-to-play if that fails. We've also added a new error that will fire if the SDK is asked to autoplay an ad but is prevented from doing so by the browser. Continue reading for more info on these solutions. The simple, advanced, and playlist IMA SDK samples use this click-to-play functionality. In short, you add a play button to your UI, and render that play button on page load. Your code should then delay calls to adDisplayContainer.initialize(), adsManager.init()and adsManager.start()until the user clicks that play button. We've added a new sample to our GitHub repo, Attempt to Autoplay. This sample will autoplay ads if allowed, and if not, will follow the above click-to-play workflow. The sample starts by attempting to autoplay the content video. If autoplay succeeds, it pauses the content to play a pre-roll. This happens in an instant, so the users will not see any content actually play before the ads. If this autoplay attempt fails, the sample renders a play button and waits for the user to click that button to initialize the ad display container and play ads. // The browser prevented the SDK from autoplaying an ad. If you have any questions, feel free to reach out to us on our support forum. This entry was posted in Ads Developer Blog and tagged ima_html5, ima_sdk on December 13, 2017 by Google Ads Developer Advisor. On March 15, 2018, we are stopping development and support for Google Media Framework (GMF) for Android in favor of the new ExoPlayer IMA extension. GMF's technology and approach are based on an older version of ExoPlayer. The new v2 version of ExoPlayer and the ExoPlayer IMA Extension make basic integration simple enough that a layer between ExoPlayer and the IMA SDK is no longer necessary. The new approach is cleaner, requires less code, and uses the most up-to-date version of ExoPlayer. Support for GMF for Android will end on March 15, 2018, after which we will no longer respond to issues or make any further releases of GMF for Android. The repository will also be shut down at this time. If you want to access the code, you can clone the repository before the March 15, 2018 shutdown date. This entry was posted in Ads Developer Blog and tagged Android, deprecation, GMF, ima_android, ima_sdk on December 8, 2017 by Google Ads Developer Advisor. This entry was posted in Ads Developer Blog and tagged Android, exoplayer, ima_sdk on September 27, 2017 by Google Ads Developer Advisor. Starting with iOS 10, Safari on iPhone and iPod supports inline video playback. This opens up some new rendering options for your video player and the IMA SDK, but also introduces some caveats. Previously, Safari on iPhone played all video in a fullscreen player. With iOS 10, Safari now supports the playsinline parameter on a video element to play that content inline. How will the IMA SDK work with inline video playback on mobile Safari? On iPhone Safari, the IMA SDK re-uses your content player to play ads. We call this "custom playback." So if you add the playsinline parameter to your content video tag, IMA ads will also play inline - it's as easy as that. 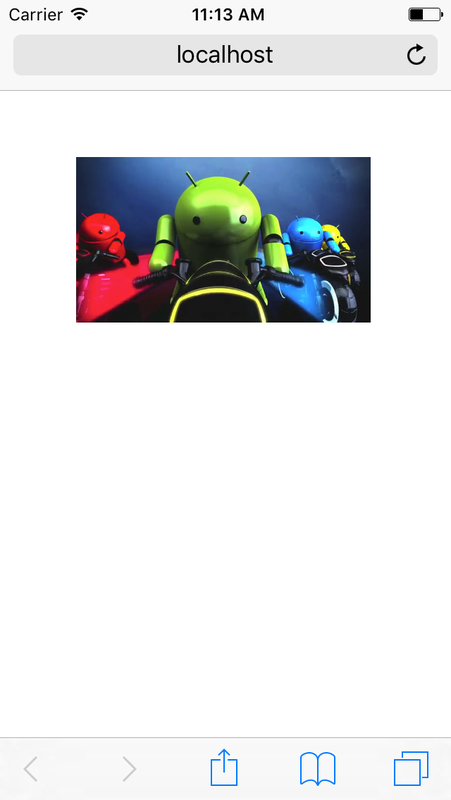 Inline video playback also opens the door for the IMA SDK to play skippable ads on iPhone Mobile Safari. 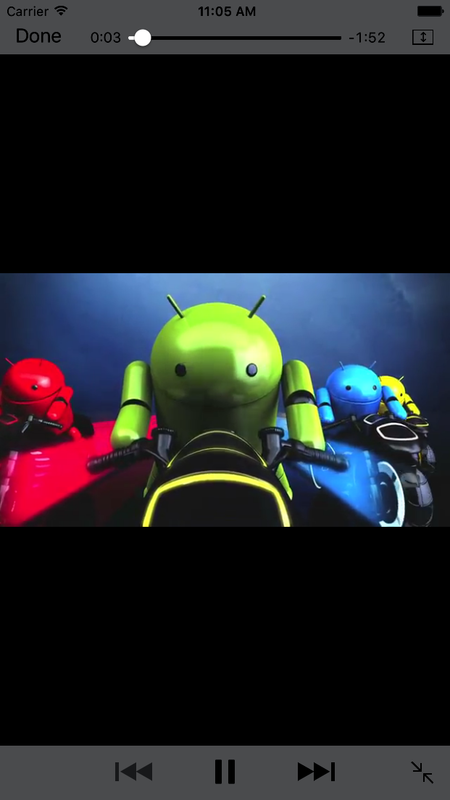 Previously these ads were dropped by the SDK because we could not render a skip button on top of the fullscreen player. If your player is inline, however, we can render that skip button, but there's a catch. IMA SDK skippable ads are not supported with the "custom playback" method. To use skippable ads, you'll need to use our new API, ImaSdkSettings.setDisableCustomPlaybackForIOS10Plus(). This will cause the IMA SDK to render the ad in its own inline player on top of your content player. That player does support skippable ads. Disabling "custom playback", however, will break your fullscreen implementation for iPhone web. Why do I need custom playback on iOS? The need for "custom playback" on iOS boils down to one thing - fullscreen support. Mobile Safari only supports fullscreen via videoPlayer.webkitEnterFullscreen(). In this mode, the SDK cannot render anything on top of your content player. Therefore, to support fullscreen ad playback we must use "custom playback". What if I want skippable ads and fullscreen support? Unfortunately, this is not possible on mobile Safari today - you must choose between support for skippable ads and support for fullscreen. What's the deal with iOS <10? Prior versions of iOS (<10) do not have support for playsinline, so pages in those environments will always use "custom playback" mode, with support for fullscreen but no support for skippable ads. That's OK! This is a complicated change with a lot of moving parts. 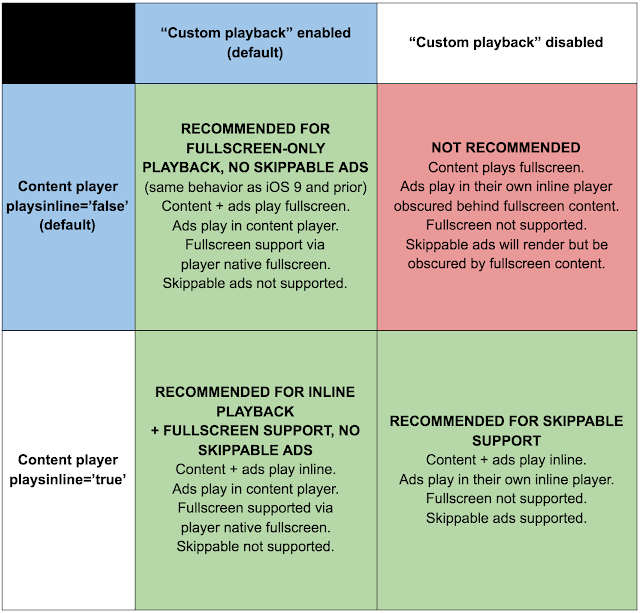 Below is a support matrix outlining what is and is not supported based on your content player's playsinline mode and the "custom playback" mode you've set for the IMA SDK. Remember, this matrix only applies to iOS 10 and above - anything running version iOS 9 or below falls into the top left quadrant of the matrix, as this is the only option. This entry was posted in Ads Developer Blog and tagged ima_html5, ima_sdk on June 27, 2017 by Google Ads Developer Advisor.